CCQ member Liz Weeks made the news recently when she was named Featured Quilter at the 2018 Sisters Outdoor Quilt Show. Liz made her first quilt in the 1970s, then quit to raise her daughter and teach elementary school. She got bitten by the quilting bug again in 1999 and hasn’t stopped since. Liz likes to make traditional quilts best. She particularly enjoys seeing the patterns and colors come together. “I like my quilts to be useful and for people to find warmth in them,” she says. When she moved to Bend in 2005, Liz became the Central Oregon Representative for Coffee Creek Quilters; she helps coordinate donations and publicity locally for us. 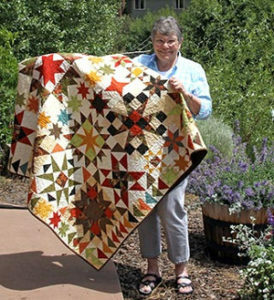 Her other volunteer activities include the Quilts for Kids project, Kiwanis Food Project, and the Sisters Quilt Show. You can learn more about Liz in the NuggetNews.com article “Featured artist finds comfort in quilts“. Thank you Liz for your past, present and future support of CCQ.